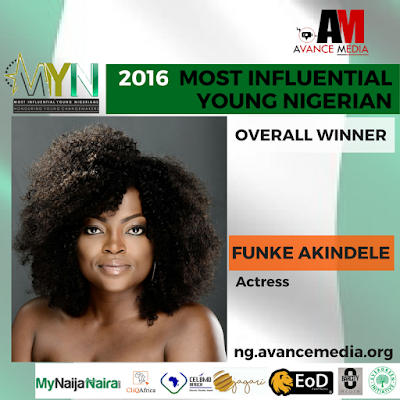 Leading Nigerian Actress and Producer Funke Akindele has been voted as the 2016 Most Influential Young Nigerian in a public ranking poll by reputable rating establishment, Avance Media. 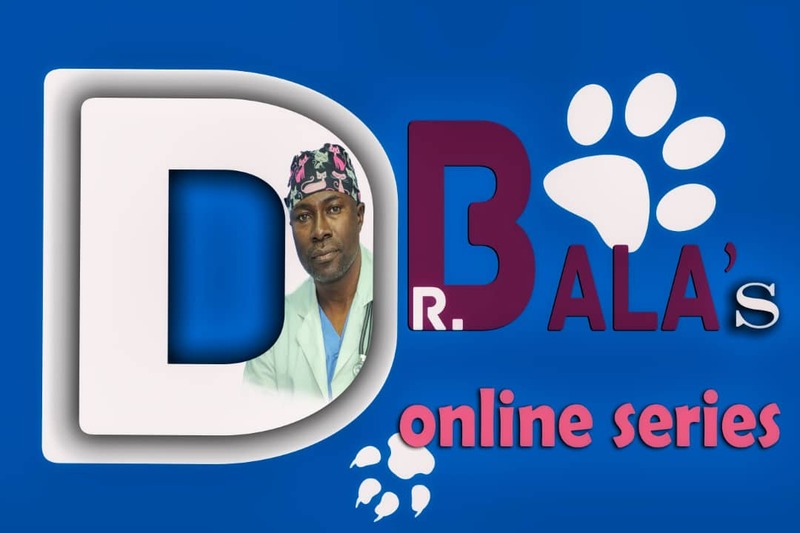 Funke Akindele who plays a lead role in the TV series Jenifa’s Diary in 2016 made lot of waves in the entertainment industry swept more accolades as she also got voted the 2016 Most Influential Young Nigerian in the Entertainment Industry as well as the Most Influential Young Nigerian lady on the ranking. 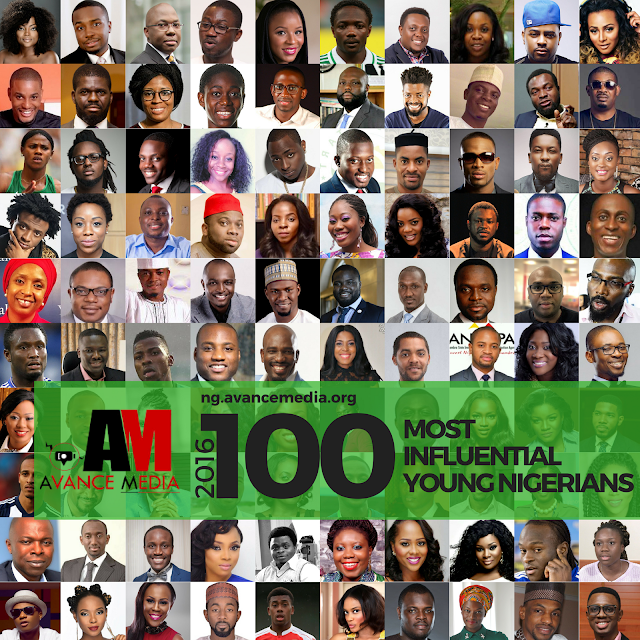 The ranking which features 100 young Nigerians between the ages of 15 to 40 was launched by Avance Media in 2016 and drew participation from over 80 countries from across the world who voted for the 100 nominees to make up the final ranking. Following Funke keenly on the ranking are Blogger Linda Ikeji, Motivational Speaker Jimi Tewe, Tara Fela Durutoye and John Obidi. MD of Avance Media, Prince Akpah extended his appreciation to all who participated in the voting process and encouraged all young Nigerians making strides to make the country better for all to continue their good work and inspire more Nigerians to become change agents. 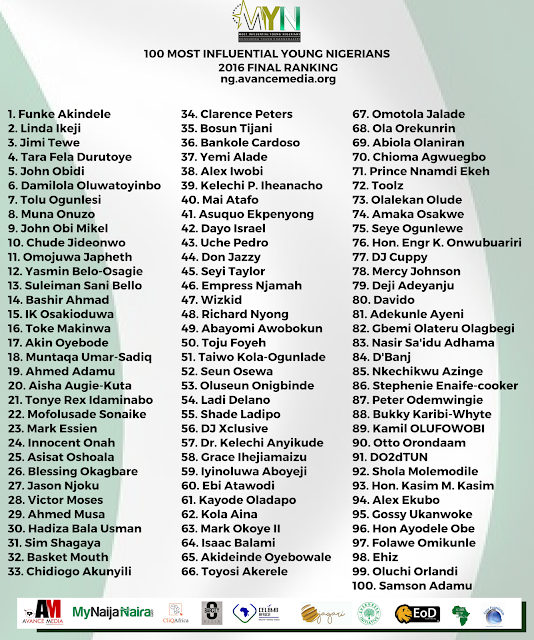 Below is the Official 2016 Ranking of Avance Media 100 Most Influential Young Nigerians. The 100 Most Influential Young Nigerians is an initiative of Avance Media in partnership with ReputationPoll.com, Barcity Media, Evergreen Initiative, EOD Partners, Jagari Designs, CELBMD Africa, My Naija Naira, Dream Ambassadors Foundation GH, iCare Hub Africa, Global Skills Exchange, Core Foundation and Project Know Thyself International.